SWB mare bred by Elisabeth Persson, Sweden.Phone+46 70 482 3559 in Swedish. Bofey Hazina comes out of the mare-family “Bofey”, which has shown to leav talented horses in three day eventing. Bofey Bridge and Bofey Click have both competed 3* ridden by the Finnish rider Sanna Siltakorpi. 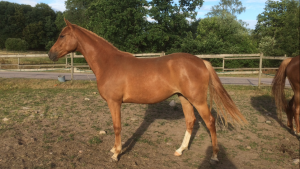 Horses on Request from elite european mare families, offered for sale by Katri Wayrynen, Flyinge.